On May 5th, 2017, NOAA/ESRL released its February, 2017 global carbon dioxide report. It placed the global mean at 405.75 ppm or 2.74 ppm above February, 2016. 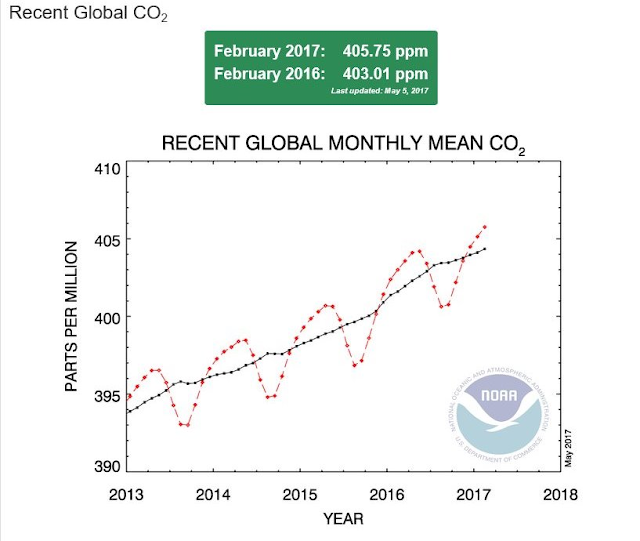 NOAA ESRL calculates the annual CO2 growth trend by averaging the December and January readings to mark the average at the end and beginning of a year. This method is helpful, yet it over and under calculates the growth rate versus actual annual mean for each entire year. This results in significant differences between this approach and the actual annual mean for any year compared to prior years. The red line represents the actual annual growth means for each full year. 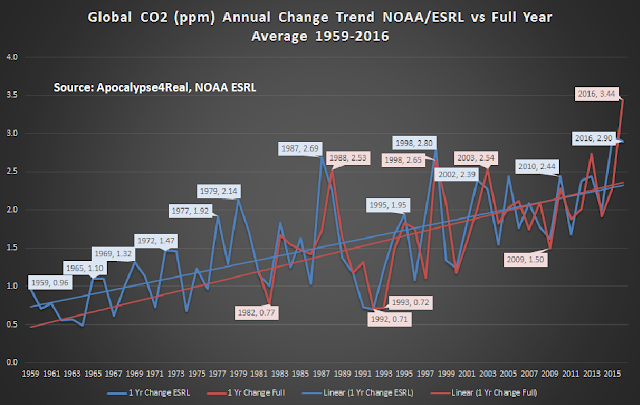 While the current NOAA ESRL methodology results in an annual growth of 2.90 ppm over 2015, the actual annual mean data comparing all of 2016 to 2015, results in a whopping 3.44 ppm increase. Both numbers will change as more samples are added and validated, but it is likely the actual annual mean 2016 CO2 growth rate will remain well above a 3 ppm increase for the first time in modern history. This continues the atmospheric CO2 increase trend observed since the first readings in March, 1958 at Mauna Loa, (MLO) Hawaii. Using the March, 1958 MLO monthly mean as a global proxy, CO2 has increased 90.04 ppm or 28.53%. The NOAA ERSL global monthly mean data is available beginning in January. 1980. 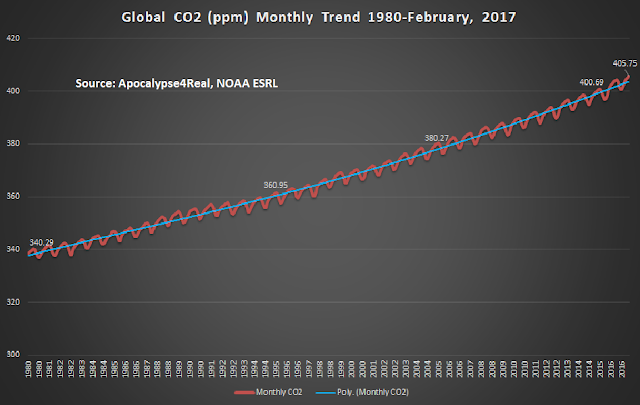 The global mean CO2 has increased by 66.60 ppm since February, 1980 or 19.64%. What is less apparent in this depiction is the CO2 increase acceleration since 1958. 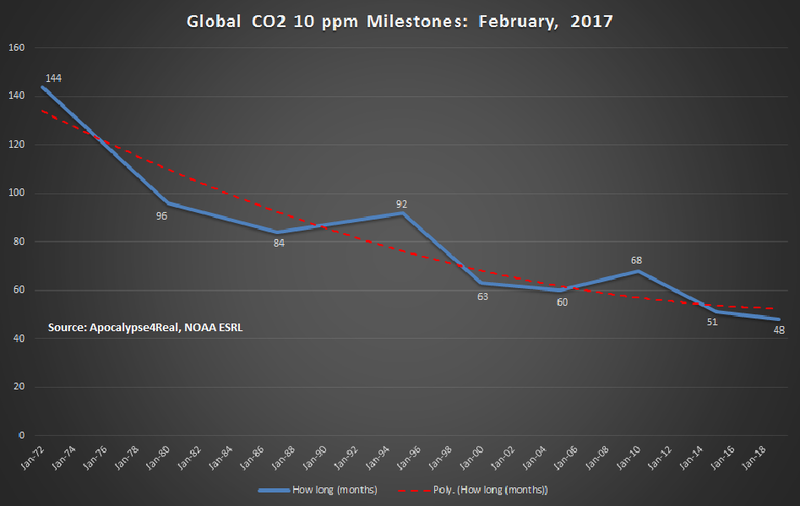 If we consider the MLO and global mean CO2 record combined, we are achieving 10 ppm "milestone" increases with worrisome acceleration. If one considers the annual, five and ten year global monthly mean change in CO2, those trends are clear. 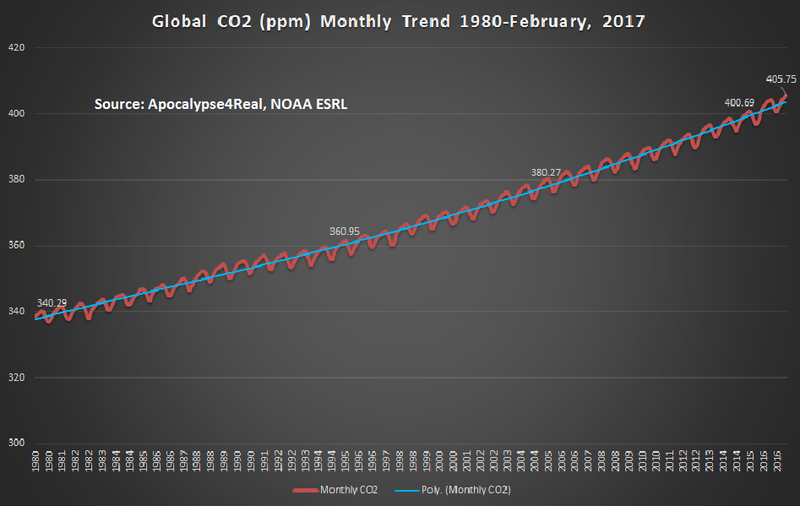 The monthly mean of 405.75 ppm for February, 2017 was 2.74 ppm higher than 2016, 12.75 ppm higher than 2012, and 22.43 ppm higher than February, 2007. The following graph depicts these trends. However, if one considers how quickly we achieve milestones of either 5 or 10 ppm increases in global CO2, the trends towards shorter times to reach each is apparent and concerning. 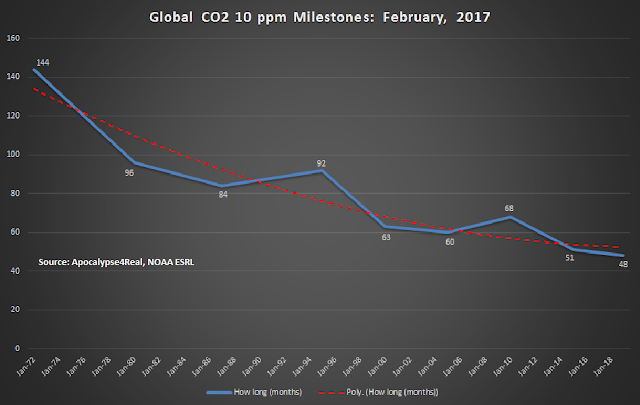 Reaching 10 ppm Increase "Milestones"
For example, MLO passed 320 ppm in May, 1960. It took 12 years or 144 months to reach 330 ppm in May, 1972. Globally, we reached 340 ppm eight years later, in May, 1980. It took only seven years to reach 350 ppm, in 1987. 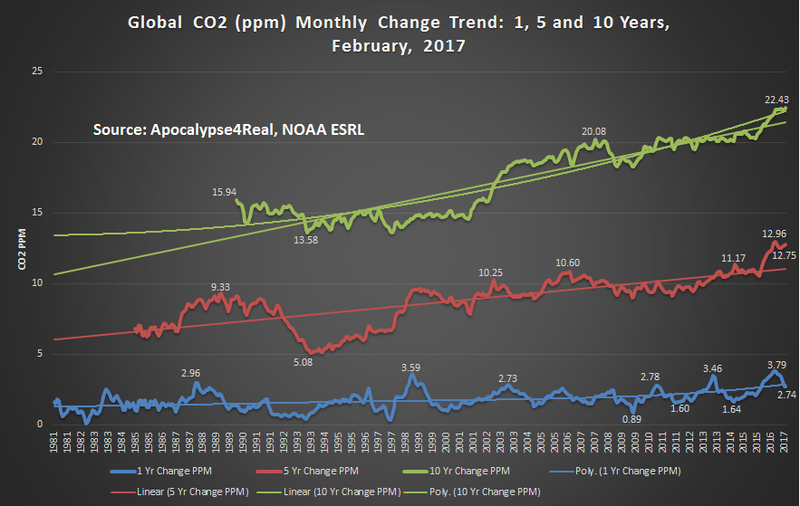 Moreover, from 1995 to 2017, we have observed an increase of 10 ppm about every 60 months or five years. However this rate has accelerated through time. Currently we are on track to conservatively increase global CO2 from 400 to 410 ppm in 48 months - four years or less. More on potential future increases later. 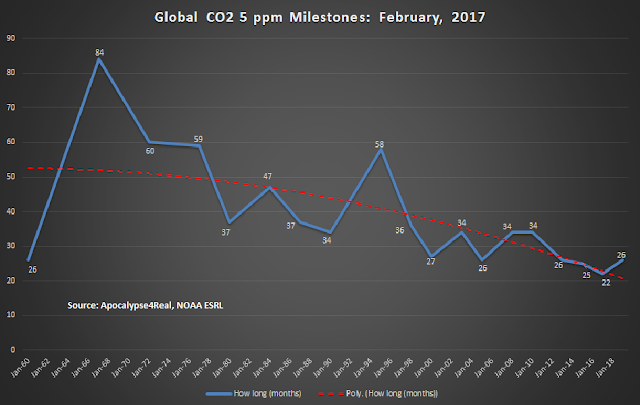 Reaching 5 ppm Increase "Milestones"
If we consider how quickly we reach 5 ppm increases, the trend is even more apparent. While MLO went from 315 to 320 ppm in a mere 26 months from 1958 to 1960, it took 84 months to increase to 325 ppm, from May 1960 to May 1967. That shortened to 60 months to go from 325 to 330 ppm, by May 1972. That time frame decreased again to 47 months to increase from 340 to 345 ppm, by April 1984. What is of real concern is that since 1995, every increase of 5 ppm has taken less that 36 months - three years. The last increase in 5 ppm, from 400 to 405 ppm, took only 22 months. That is the shortest time for any global monthly mean 5 ppm increase. With this acceleration, even with allowance for the slowdown in CO2 increases after an El Nino effect has ended, one can conservatively estimate that we will hit 410 ppm by March, 2019, only 48 months since blowing through 400 ppm. Some trace gas monitoring stations have already measured readings well above 410 ppm in the Arctic, and MLO has had daily readings above 410 ppm this year for the first time. 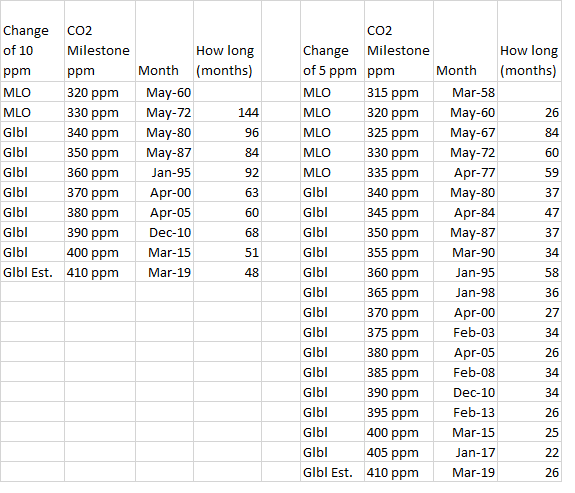 Here is the full table from NOAA ESRL Mean Monthly MLO and Global CO2 "milestones." 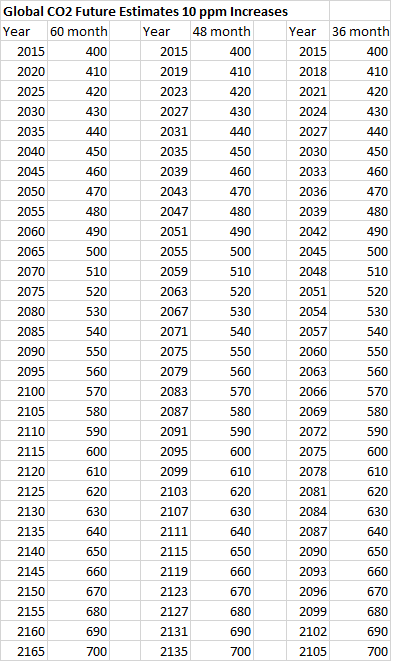 After looking at how we continue to experience accelerating global CO2 monthly means, and how we are shortening the time frames to achieve each one, here is a simple set of hypothetical projections based upon various rates of hitting future 10 ppm milestones. The first (left table) assumes a return to a lower rate of increase, a 60 month, or five year time frame for each 10 ppm "milestone". The second (middle table) captures the current rate we seem to be moving towards, a 10 ppm increase every 48 months, or four years. However, the change of 2016 from 2015 was a rate that would see us meet a 10 ppm increase every 36 months or so, about every three years. The right table depicts that rate of change. These are like making a choice between poisons for our global community, slow or fast acting. If we revert to a 60 month increase for each 10 ppm, we double CO2 to 560 ppm from the pre-industrial concentration of 280 ppm by the end of the century, about the year 2095. If we move to a 48 month increase rate, we hit that doubling, 560 ppm, by 2079. If we continue to experience CO2 increases from human sources and natural feed backs, and drop to a 36 month time frame for each 10 ppm increase, we hit 560 ppm by 2063. This is what is at stake for the future generations, a warmer and more at risk world. Perhaps we should not call these "milestones" but "millstones." The real problem? This is only CO2. The real picture for all trace gases has us way beyond the Paris Agreement today. That is for a future post.